For some people, the tastiest dish in the world is meaningless if there is no salad served along with it. 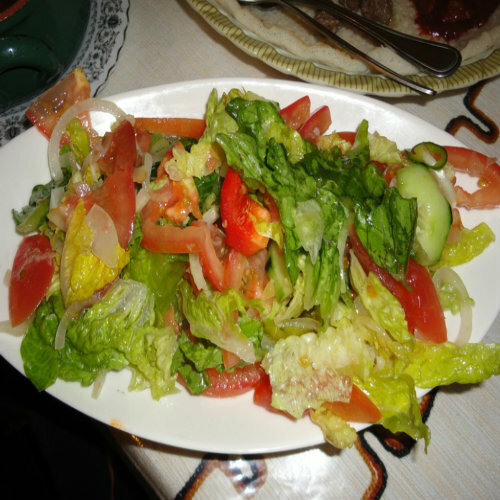 When we talk about salads they are countless but the simple a salad, the better it is considered. One simple salad that you can conveniently prepare at home without much fuss is a Chili and Tomato Green Salad. As the name implies, the main ingredients of this salad are Chilies and Tomatoes. However, in order to add up more to the taste and presentation, there are some more ingredients added which are also easily available. The salad, being a combination of fresh tomatoes and some steaming fresh green chilies, is an awesome appetizer just before a special meal. It is quite easy to prepare this salad at home with all the required ingredients available as mentioned below. Follow the steps if you are trying to prepare this salad for the first time. Take a large-sized salad bowl and wash it with tap water to ensure that there is no dust or dirt left inside. Put all the ingredients one by one into the salad bowl. It is good to base the bowl with lettuce and green chilies while the other ingredients are added afterwards. With all the ingredients inside the salad bowl, start tossing them with the help of a slotted spoon and fork such that all the ingredients are perfectly blended together. If desired, you may add some black pepper, olive oil, vinegar or lemon juice for some taste before serving.